Let yourself be swept away by the sights, sounds and colours of Spain, Portugal and Morocco on this incredible 21-day trip. From the bustling cities of Barcelona and Madrid to the colourful mosques and magical bazaars of Casablanca and Marrakech, this bucket-list journey will showcase the best of all three countries. 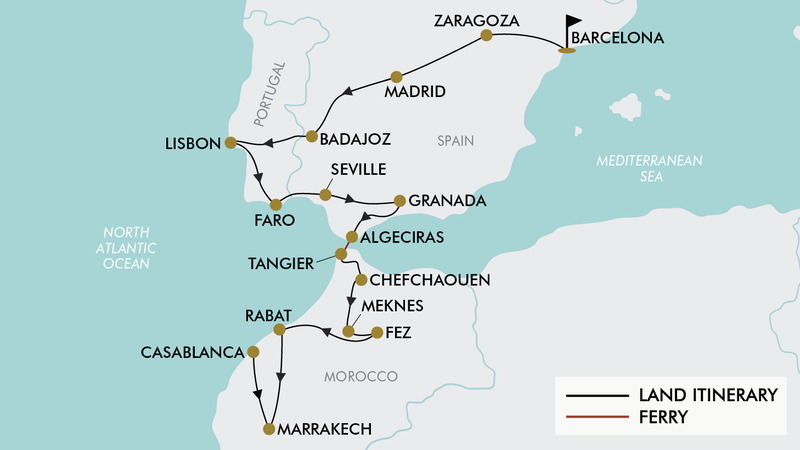 Start with guided tours of Barcelona, Lisbon and Madrid; wander through the charismatic city of Seville; witness the stunning beauty of Alhambra Palace rising above Granada; and then travel by ferry to Tangier in Morocco. From here, experience the blue-washed town of Chefchaouen, along the Roman ruins of Volubilis, the Hassan II Mosque in Casablanca, and so many more of the world's most incredible sights. Your trip includes return international flights, 18 nights 4 or 5-star hotel accommodation, 25 meals, English-speaking tour leader and guides, and more. Today depart from Auckland, *Christchurch or *Wellington for Barcelona, Spain. Fly with either Emirates, British Airways, Lufthansa or Austrian Airlines to name a few (subject to availability). Welcome to Barcelona! Be met on arrival and transferred to the hotel for the night. After breakfast, enjoy a half day guided tour of the city (approx. 4 hours). Travel though the infamous Gothic Quarters, Placa de Catalunya, Paseo de Gracia and Las Ramblas, Barcelona’s most famous street! Also, see Gaudi’s inspirational Sagrada Familia (entrance not included). Once the tour finishes enjoy the afternoon at leisure to relax or continue exploring on your own. After breakfast travel to Madrid. On the way stop at Zaragoza. See historical monuments such as Basilica del Pilar, Cathedral of San Salvador, and Aljafería Palace (entrances not included). The city also has renewed infrastructures from the 2008 International Exposition: Water Tower, Bridge Pavilion and river Aquarium. Continue your journey to Madrid for the night. Enjoy breakfast at the hotel before departing on a half day guided city tour. Take in sights such as Gran Vía, known as the ‘Spanish Broadway’ and the street that never sleeps; Plaza Espana; Puerta del Sol, Paseo de Castellana; Puerta Toledo and the Puerta de Alcala. You will also see the Royal Palace (entrance not included); official residence of the Spanish Royal Family and the historic Cathedral de Almudena (entrance not included). Continue your Spanish journey as you travel to Badajoz, which is situated on the left bank of the river Guadiana, close to the Portuguese border. Enjoy the remainder of the day at leisure. Perhaps take a stroll around the historic quarter, which will reveal Arab walls, interesting monuments, and picturesque streets. After breakfast depart for Lisbon, the capital of Portugal. Enjoy the rest of the day at leisure in this beautiful city, which embraces modern culture whilst maintaining its unique heritage and traditions. Today enjoy a half-day guided tour of Lisbon. Wander through the maze-like streets to reach the main attractions. See Lisbon’s Cathedral and Casa dos Bicos, the old city’s pastel-coloured buildings, Tagus Estuary and the Ponte 25 de Abril suspension bridge. Afterwards enjoy the remainder of the day at leisure. Today continue to Faro, the capital of southern Portugal’s Algarve region. The city’s neoclassical Arco da Vila is on the site of a gate that was part of the original Moorish wall. The monumental archway leads to the old town, with its cobbled streets. Nearby is Faro Cathedral, built in the 13th century. The Municipal Museum, in a 16th-century convent, displays prehistoric and medieval artifacts, plus religious art. Faro is a fascinating city, which combines an extensive history, interesting tourist attractions and an abundance of Portuguese charm. Continue your journey to the capital of southern Spain’s Andalusia region, Seville. It’s famous for flamenco dancing particularly in its Triana neighbourhood. Join your tour leader for a morning walking tour of the city. See the gothic Cathedral and the Giralda Tower, a former minaret converted to a bell tower (entrances not included). See the tiled fountains, pavilions and lush palms in the Maria Luisa Park - renowned for its landscape design - and walk through the imposing Plaza de España. Also, walk through the former Jewish quarter. The rest of the day is free at leisure. Tonight you might like to experience a fiery flamenco show (not included). Today depart for Granada, at the foothills of the Sierra Nevada mountains. Granada is a jewel of Hispano-Islamic art featuring striking arches and Byzantine mosaics, a place where serene Islamic architecture and Arab-flavoured street life go hand in hand with monumental churches, old-school tapas bars and counter-culture graffiti art. Enjoy the remainder of the day at leisure. Today enjoy the day at leisure to explore on your own. You might like to visit the UNESCO World Heritage Alhambra Palace (not included). Guests who are interested in doing this day trip are advised to book tickets online well in advance in order to secure their place. Please note: this tour cannot be booked whilst on tour with the operator. After breakfast, you will be transferred to the cruise port of Algeciras, where you will board the ferry to Tangier, Morocco (approx. 1hour). Tangier is a Moroccan port city on the Strait of Gibraltar, which has been a strategic gateway between Africa and Europe since Phoenician times. Upon arrival, you will enjoy a guided tour of the Medina. Drive today to Chefchaouen, a hidden gem and one of the most beautiful cities on the planet. Tour Chefchaouen, the blue-washed old town (medina) by foot along with your guide, who will share stories of Chefchaouen’s history. Start your tour with the Kasbah Museum in the medina. The Kasbah of Chefchaouen belongs to the early 18th century, and was built by the legendary ruler Moulay Ismail. It is fairly simple in design without architectural surprises, however it is surrounded by gardens on the interior and exterior. Inside the Kasbah you can visit the ethnographic museum, which contains antique weapons, musical instruments and photographs of the old town. After exploring the medina, drive to the ruins of the ancient Roman city of Volubilis. Next head to Meknes, an imperial city under the protection of UNESCO since 1996. Explore the Bab el Khemis and the Jewish neighbourhood of the Medina. Discover the remains of a huge loft of the 17th Century and the mausoleum of Moulay Ismail. In the late afternoon, continue to Fez. Tonight you will enjoy dinner at the hotel. Today enjoy a sightseeing tour of Fez. See Islamic Architecture, UNESCO World Heritage Sites, historic monuments and Jewish Heritage (Synagogue and Mellah). Begin the day in the oldest working medina in the world that many refer to as a living museum. Visit the 14th Century Palace Gates of the King. The Royal Palace in Fez is one of the oldest (14th Century) and largest in Morocco. Next visit the Jewish Mellah. Witness the dyers souk of silk, wool and cotton. Cross the carpentry area and enter Attarine Street, filled with scents of spices and oils. Visit the tanneries and the Bou Inania Madrasa. The Bou Inania Madrasa was founded in 1351-56 by Abu Inan Faris, who also founded the Bou Inania Madrasa in Meknes. Enjoy this evening at leisure or take the opportunity to join an optional dinner (not included). The dinner will be in a local family house in the heart of the medina of Fez - an opportunity to discover Moroccan cuisine, the lifestyle and learn about local traditions. This morning depart for Rabat. Upon arrival enjoy a guided tour of the main monuments of the medina. Visit the Royal Palace (Mechouar), the Kasbah des Oudayas, the Mausoleum of Mohammed V, and Hassan Tower (entrances included). Following breakfast, travel to Marrakech. Enjoy the rest of the day at leisure to discover the Medina or visit the vibrant Jemaa El Fna, the famous square and market place. This morning after breakfast enjoy a guided tour to discover the spectacular sights of Marrakech. The city guide will take you to see the Bahia Palace, the 16th century Saadian tombs, and the Dar Si Said Museum (entrance not included). Next enjoy some free time to visit the largest mosque in Marrakech, Koutoubia, or perhaps venture through the old streets of the medina to the Koranic School and the Museum of Marrakech. The evening is free at leisure. Today depart Marrakech and journey on to the iconic city of Casablanca. The economic and financial capital, and the second largest port city in Morocco, Casablanca is endowed with a special charm. See the Hassan II Mosque, an important religious and cultural site built on the sea and dominated by its 210m high minaret (entrance not included). Enjoy the evening free at leisure. At the appropriate time you will be transferred to Casablanca Airport for your return flight back to New Zealand. Please note: If your flight departs early, breakfast will be arranged for pick up from the hotel reception the night before. Travel offer is valid for travel on selected dates until the 10th of November 2020. For solo travellers a mandatory single supplement of $1700 applies. - Visa fees and requirements (A tourist visa is not required for Europe and Morocco if travelling on a New Zealand Passport). - Recommended gratuities/tipping: €5 per person per day. - City Tax Lisbon: €2 per person per night. - City Tax Lloret del Mar (Barcelona area) €2 per person per night. Portugal is classified as a warm temperate forest climate, with wet winters, dry summers and the warmest month above 22°C on average. The best time to visit Portugal is spring (March to June) when dazzling flowers carpet hillsides and the almond blossom lights up the countryside – or early autumn, (September to November) when the weather is warm but not too hot and the summer crowds have thinned out. In Spain, August is the hottest month with an average temperature of 24°C with the most daily sunshine hours. Spain enjoys a warm Spring and Autumn. Morocco's climate is moderate and subtropical, cooled by breezes off the Atlantic and Mediterranean. In the interior the temperatures are more extreme, winters can be fairly cold and the summers very hot. The country is at its most beautiful in spring when the landscape is green and lush, making for spectacular mountain hiking. Morocco is also lovely in Autumn (September to November) and Spring (March to June) when temperatures are very pleasant. 25 meals are included in the tour, for all other meals; lunches and dinners the tour leader (when available) will offer assistance with reservations, suggestions and directions to local restaurants. It is your responsibility to notify TripADeal of any dietary requests/requirements. Please note; we will do our best to meet your requests/requirements, however, cannot guarantee that we will always be able to. A tourist visa for Europe and Morocco is not required if travelling on a New Zealand passport.